Type Locality Lake near Río Ucayali, Peru. Etymology Ageneiosus: From the Greek a, meaning without and genias, meaning beard; in reference to the apparent lack of barbels (the fish has very short maxillary barbels that are almost indistinguishable). 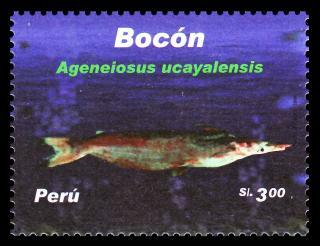 The species is named after the type locality. Size 325mm or 12.8" SL. Find near, nearer or same sized spp. Distribution South America: Amazon and Orinoco River basins; Guianas and upper Paraná River basin. Feeding In nature, the diet of this fish consists mainly of other fish.